As parents and teens look to fill their summers with vacation, camp and pre-college visits, Tribeca Flashpoint College is extending its NEXT LEVEL summer workshops for 2015. 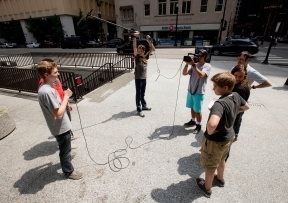 Throughout July, high school students can participate in workshops focusing on visual effects, film production, graphic design and music recording in the vibrant urban setting of Tribeca Flashpoint College in downtown Chicago. Working closely with the school’s faculty of industry professionals, students from around the country will create multifaceted digital media productions during this unique summer program. Beginning July 6 through July 31; dates and times vary per workshop. Open to high school students, grades 9-12, nationwide, who are interested in strengthening their artistic skills, deepening their knowledge of industry-standard software, and creating new possibilities for a successful career in digital media. Tribeca Flashpoint College, 28 N. Clark Street, Suite 500, Chicago, IL 60602. For more information, visit www.tribecaflashpoint.edu/hsprogram.